I really like Maude on Friday nights. It's open late, it's in my neighborhood, and the music is the kind that makes you do the Jon Stewart Headshake of Pure Amazement, where he flaps his lips and cheeks and goes "Huh?" 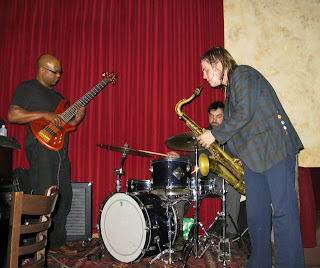 I mean, seriously: Lewis, Cox, and Bates playing in a restaurant? Some people come for the food and end up getting slapped around by the jazz. By now Maude's antics are well enough known that others come because of the music. Tonight Lucia Newell wanders in, and James Buckley, and Scott Anderson, the manager of the Dakota, and Bryan Aaker, staff photographer for the Cedar Cultural Center. We sit with Mike's mom, Mary. I recognize some of the music but the only standard the trio plays (as far as I can tell) is "Alone Together," and I'm reminded that as much as Lewis blows sparks and fire, he can also play ballads that will break your heart. Photo, L to R: Cox, Bates, Lewis. Taken with a flash near the end of the evening; it is not that bright in the restaurant. P.S. Michael Lewis is next on my handmade hats list. Chris Bates, I need your cranial stats if you want a hat before the spring thaw.